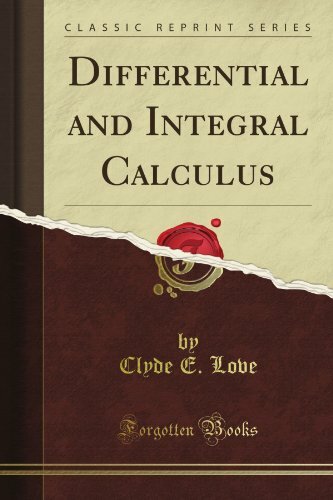 This book presents a first course in the calculus substantially as the author has taught it at the University of Michigan for a number of years. In the treatment of each topic, the text is intended to contain a precise statement of the fundamental principle involved, and to insure the student's clear understanding of this principle, without distracting his attention by the discussion of a multitude of details. These are lecture notes of a freshmen-level and sophomore-level mathematics class offered at Arkansas Tech University. The text represents a serious effort to produce exposition that is accessible to a student at freshmen or sophomore levels. A concise textbook covering precalculus through vector calculus and differential equations using informal infinitesimal reasoning. Always gives the most illuminating proofs possible, while standard books obscure key ideas under pedantic formalism. The book covers the standard Calculus I and II courses, with Calculus III under development. It is accessible to first year college and university students. The emphasis in this course is on problems -- doing calculations and story problems. The author made special effort to present the calculus in a simple and direct form. Easy applications of the calculus to maxima and minima, tangents and normals, inflexions, asymptotes, and curve tracing have been introduced.